Giveaway: Win Pixar Short Films Collection Vol. 3 On Bluray! We've got a special treat for our Pixar fans out there! 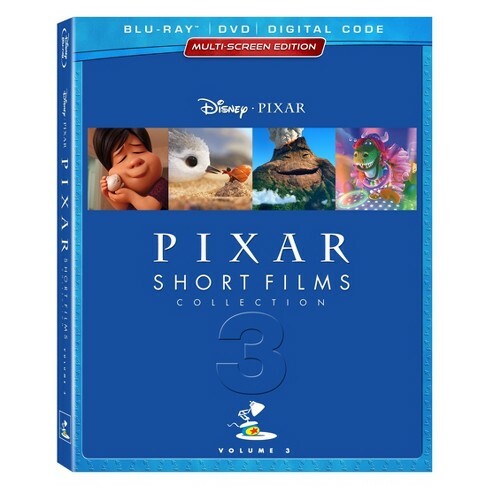 You can enter to win a Bluray of the Pixar Short Film Collection Vol. 3! It brings together some of Pixar's best animated short films, including Bao, Partysaurus Rex, Piper, Sanjay's Super Team, Riley's First Date, Lava, and more! SYNOPSIS: From Disney•Pixar and the creative minds who brought you The Incredibles, Finding Nemo and Toy Story comes the studio’s latest collection of delightful and inspiring animated stories – Pixar Shorts: Volume 3. Thirteen shorts including Oscar®-winner Piper (Best Animated Short, 2016) and nominees Sanjay’s Super Team (2015) and Lou (2017). With unforgettable characters, insightful bonus extras, and cutting-edge animation, it’s a must-own for any movie fan! To enter, send an email to punchdrunktrav@gmail.com with your full name, mailing address, and favorite Pixar short film! Please include "PIXAR BLURAY CONTEST" in the subject line! Winners will be selected on Monday, November 19th and notified by email. Good luck!